Rats are an all-too-common problem for many folks around the Dallas area, especially as the increasing temperatures drive the rodents to find shelter in homes and offices. A rat infestation can bring damage and destruction to your home and serious health issues to your family. 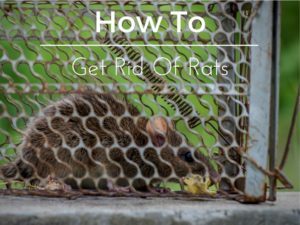 The following simple techniques will help you get the rats out, and keep them out for good. Find their Nesting Area – To prevent an infestation from growing and spreading throughout your home or office, you need to find where they are nesting and isolate it. From there you can cut off food and water supplies, seal entry points, and set traps to start eliminating the rodents. Snap Traps – These traps often kill rats instantly, but can be quite messy. A professional will have to remove the rat carcasses to avoid the spread of infectious disease. Glue Traps – Known to kill rats slowly and inhumanely, you should avoid glue traps if possible. The rats may crawl around for a short time if they escape the trap, leaving glue residue everywhere. Live Traps – Useful for smaller infestations, live traps allow you or a professional to relocate the critters safely, leaving them unharmed. Poison should never be used under any circumstance. It is dangerous to both humans and pets and can be fatal if used incorrectly. Call a Professional – Once the rats have been isolated and trapped, the next step is to call a professional to remove them from your building. Touching a rat whether it be dead or alive, puts you at serious risk for contracting diseases like leptospirosis, Hantavirus, and rat-bite fever. The safest and most effective option for rat removal will always be using a professional service like Critter Control® of Dallas. Dealing with a rat infestation is not only frustrating, but it is also potentially risky as well. The longer they are allowed to live in your home or business, the more costly the damage will be. Call us today at 817-222-1101 to schedule your consultation.